Magnetic Cash Clip (Nylon): Many Big Skinny customer's report this cash clips being hugely well-received among husbands and dads everywhere. Many men love the simple function of this clip. The nylon microfiber material is soft and super slim, cutting down on any extra bulk and the sturdy magnets are able firmly hold more than 20 banknotes. Money Clip Wallet (Nylon): Offering a slight twist on the money clip, this wallet combines a card case and a money clip in one handy unit. 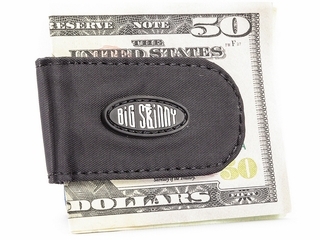 The magnetic clip sits of the outside wall of the wallet where more than 20 bills can be held in place. The rest of the wallet is dedicated to holding plastic cards. There is even a clear ID pocket on the front of the wallet. The fabric used to construct this wallet is the super slim nylon micro-fiber material which means the wallet itself is extremely thin and compact. 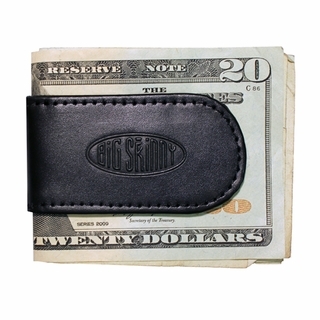 Leather Magnetic Cash Holder: With the same great features of the nylon magnetic cash clip, Big Skinny also offers a leather version. This clip is made using top grain cowhide on the outside with an inside lining of nylon micro-fiber to ensure the magnets can maintain a secure hold of the bills. This clip has a very elegant exterior. Leather Magnetic Money Clip Wallet: With the added sleekness of the top grain cowhide leather, this version of the magnetic money clip wallet is stylish and beautiful. Big Skinny decided to bring this product back to production after customers demanded it be returned to the website. It is a hit among minimalists who want to stay organized. Store up to 20 folded bills in the clip and up to 12 plastic cards in the card pockets.